Though a number of texts for teaching Biblical Greek now exist, most are plagued by various deficiencies that detract from effective instruction within the time limits set by most college and seminary programs. 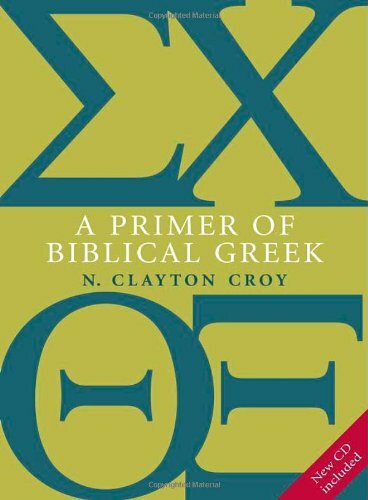 This new primer by N. Clayton Croy offers a succinct, single-volume introduction to Biblical Greek that has already been tested in classrooms around the country. Taking a primarily deductive approach to teaching Biblical Greek, this volume assumes that students will have no prior knowledge in Greek. Divided into 32 separate lessons, each containing a generous number of exercises, the text leads students from the Greek alphabet to a working understanding of the language of the Bible. Special features of this grammar: An abundance of exercises: Each lesson includes practice sentences taken from the Septuagint and the New Testament, as well as sentences composed by the author. Exercises in English-to-Greek translation are also included. Concise but accurate grammatical explanations: Great care has been taken to insure that grammatical explanations are clear, correct, and succinct. The Greek participle also receives a fuller treatment than is usual. A natural order of presentation: Material is presented according to the natural structure of Greek and the traditional terminology of grammarians. Declensions and principal parts, for example, are presented in numerical order. Helpful appendixes for quick reference: Included at the back of the book are the Greek paradigms, Greek-to-English vocabulary, English-to-Greek vocabulary, and a bibliography for further study. Designed to provide students with the skills necessary to handle biblical Greek, this volume will become the text of choice for colleges and seminaries.